This review aims to provide an overview of sports medicine principles pertaining to youth Para athletes. While little research on youth Para athletics exists, recent elite Paralympic Games data confirms a higher rate of upper extremity injuries in wheelchair athletes and lower extremity injuries in ambulatory athletes, while showing a higher rate of acute injuries in the Winter Games and skin/soft-tissue injuries in Summer Games. These summer sport findings are consistent with historic youth Para sport data. Clinicians caring for youth Para athletes should be aware of medical considerations for Para athletes with various medical conditions. 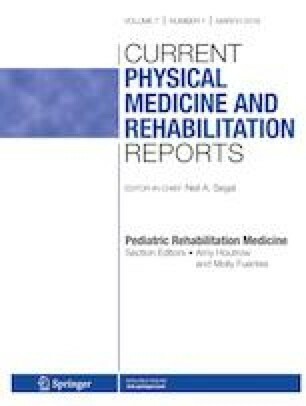 While little research exists specifically on youth Para sport, we review pediatric rehabilitation medicine and sports medicine principles and data from the adult literature to help prepare clinicians caring for this population. Future research should focus on injury patterns and injury prevention in the youth Para sport population. Mary Dubon reports that her husband is employed by and has stock ownership in an orthopedic PACS company, Medstrat. D. Kiko Van Zandt reports that from 2004 to 2013, she served as an assistant swim coach for the U.S. Paralympic Swim Team. This included a number of travel trips to foreign countries for competitions including the Paralympic Games, Pan American Games, World Championships, and Para Pan Pacific Championship. Travel, lodging, and meals were provided by U.S. Paralympics. A small stipend was also paid for services rendered for each trip. Craig Rovito and Cheri Blauwet declare no conflicts of interest relevant to this manuscript. Paralympics History - History of the Paralympic Movement. In: Int. Paralympic Comm. https://www.paralympic.org/the-ipc/history-of-the-movement. Accessed 19 Jul 2018. Paralympic Sports - List of Para Sports and Events. https://www.paralympic.org/sports. Accessed 19 Jul 2018. (2018) Boccia International Sports Federation International Boccia Rules - 2018. http://www.bisfed.com/wp-content/uploads/2014/01/V.3_with_markup.pdf. Accessed 22 Jul 2018. (2014) UCI Para-cycling Classification Guide. http://www.uci.ch/mm/Document/News/NewsGeneral/16/59/20/UCIClassificationGuide_English.pdf. Accessed 22 Jul 2018. (2012) Para-equestrian classification manual equestrian competition for athletes with disabilities. https://inside.fei.org/system/files/PED_2012Classification manual_21feb_markup_version.pdf. Accessed 22 Jul 2018. (2018) IWRF Wheelchair Rugby Ready : Before playing. http://www.wheelchairrugbyready.com/?module=1&section=3&subsection=41. Accessed 22 Jul 2018. Tweedy SM, Beckman EM, Connick MJ. Paralympic classification: conceptual basis, current methods, and research update. PM R. 2014;6(8 Suppl):S11–7. https://doi.org/10.1016/j.pmrj.2014.04.013. World Para Swimming Classification & Categories - SB9, SM8. In: World Para Swim. https://www.paralympic.org/swimming/classification. Accessed 21 Jul 2018.
International Standards for Neurological Classification of SCI (ISNCSCI) Worksheet. In: ISNCSCI. http://asia-spinalinjury.org/wp-content/uploads/2016/02/International_Stds_Diagram_Worksheet.pdf. Accessed 19 Jul 2018. ISNCSCI Exam pediatric brochure. In: ISNCSCI http://asia-spinalinjury.org/wp-content/uploads/2018/01/ASIA_Exam_Pediatric-Brochure-11-16-17.pdf. Accessed 3 Mar 2019. Patel DR, Greydanus DE. Sport participation by physically and cognitively challenged young athletes. 2010. https://doi.org/10.1016/j.pcl.2010.03.002. Paralyzed Veterans of America. Consortium for spinal cord medicine clinical practice guidelines: acute management of autonomic dysreflexia: individuals with spinal cord injury presenting to health-care facilities, 2nd Edition. http://www.pva.org/media/pdf/cpg_autonomic%20dysreflexia.pdf (2001). Accessed 22 Jan 2019. (2013) The international society for clinical densitometry 2013 official positions: adult & pediatric. https://iscd.app.box.com/v/OP-ISCD-2013-Adult-Ped-Eng. Accessed 20 Jul 2018. Kokorelis C, Trovato M. Osteoporosis / osteopenia in children. In: PM&RknowledgeNOW. 2018. https://now.aapmr.org/osteoporosis-osteopenia-in-children/. Accessed 20 Jul 2018. Harvey AR, Baker LB, Reddihough DS, Scheinberg A, Williams K. Trihexyphenidyl for dystonia in cerebral palsy. Cochrane Database Syst Rev. 2018. https://doi.org/10.1002/14651858.CD012430.pub2. Vernier E. Taking Seizure Precautions | Epilepsy Foundation. 2015. https://www.epilepsy.com/article/2015/5/taking-seizure-precautions. Accessed 21 Jul 2018. Seizure Precautions. In: Healthline. https://www.healthline.com/health/seizure-precautions. Accessed 21 Jul 2018. Saigal R, Hunt Batjer H, Ellenbogen RG, Berger MS. Return to Play for Neurosurgical Patients. https://doi.org/10.1016/j.wneu.2014.06.043. World Anti-Doping Agency (WADA). In: WADA. https://www.wada-ama.org/. Accessed 19 Jul 2018. •• Brenner JS. Sports specialization and intensive training in young athletes. Am Acad Pediatr Pediatr. 2016. https://doi.org/10.1542/peds.2016-2148. Clinical Report from the American Academy of Pediatrics on the topic of sports specialization in youth athletes.